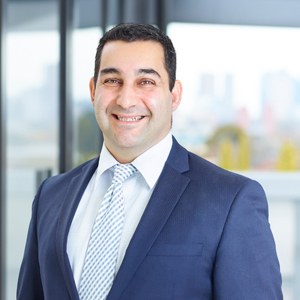 Michael Zakhem’s successful career in real estate is underpinned by his simple, yet powerful work and life philosophy. He truly believes that any achievement requires hard work, a pleasant demeanour and ultimate respect for those around him. It’s a philosophy that has earned him great respect in his local community, and a outstanding loyal following from buyers and sellers alike. From a family of keen property investors, the foundation for Michael’s 10 year career was formed from a very early age. Now enjoying consistent results as a top performer within the company, and highly sought after for expert knowledge and advice, his natural empathy combines with a determined, no-nonsense approach to achieve his client’s ultimate property goals. A focused listener with an intuitive ability to understand the needs of both buyers and sellers, Michael brings a calm, level-headed approach to all property transactions. However, intertwined in his nature is a passion and skill for negotiating, maximising his ability to achieve exceptional results, while ensuring that the buying and selling process is efficient and enjoyable at all times. With his wife and young family alongside, he loves to unwind watching AFL football, soccer and motor sports. Michael - we couldn't be more happy and thankful for all the hard work you did for us to get that unbelievable result. To think, there were 6 properties exactly the same as ours on the market on the same day, it is a credit to you Michael, and your team on all the little things. You provided us with constant feedback on buyers and any improvements we needed to make that helped achieve more the $150K over our reserve. We have bought and sold many properties and have never met an agent who we could totally trust until we met you. We will no doubt be recommending you to family and friends at every opportunity. Michael Zakhem met with us and impressed us so much with his professionalism and honesty that we did not need to seek the advice of any others. We found him to be courteous, honest and reliable.